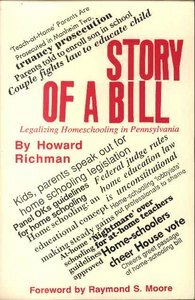 Story of a Bill: Legalizing Homeschooling in PA by Howard Richman, $6.95, 152 pp. This is the suspenseful story of how the homeschooling law was passed in Pennsylvania with a major role taken by homeschooled students. It's an education in civics for you and your children. You will gain an education in how bills become law in a state capitol as well as be entertained by what is really a very gripping story, full of human interest... The fast pace of a novel, the tension of a whodunit, and a happy ending! -- Mary Pride.